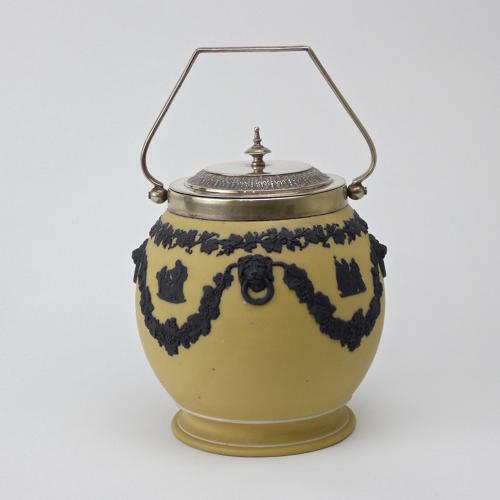 A Wedgwood, yellow jasper dip biscuit barrel with black relief. This piece is impressed, to the base, with the marks 'WEDGWOOD' and a letter 'B' and it dates from c.1870. It has a silver plated lid and mounts, with a folding handle. This is one of the more unusual colour combinations which was produced by Wedgwood. It is decorated with four small classical reliefs above which is a band of grapes and vines, and beneath are garlands of the same hanging from lion masks. The reliefs are all good quality and the piece is in excellent condition. There is one small, dark mark in the yellow dip but this is from the time of manufacture.